Your new puppy is adorable. His silly antics bring you joy, and you can’t help but smile when he softly licks your cheek. However, he’s also been keeping you up at night with constant whining, and it’s making you feel fairly miserable. Fortunately, it doesn’t have to be like this. Why Does a Puppy Make So Much Noise in the Middle of the Night? Since a puppy is the canine equivalent of a baby, you may anticipate your pooch acting like an infant or toddler when it comes to sleeping during the night. There are plenty of sound reasons why your pooch may be making nocturnal noise during those first few weeks within your home. Most of them chiefly pertain to the environment that surrounds him. 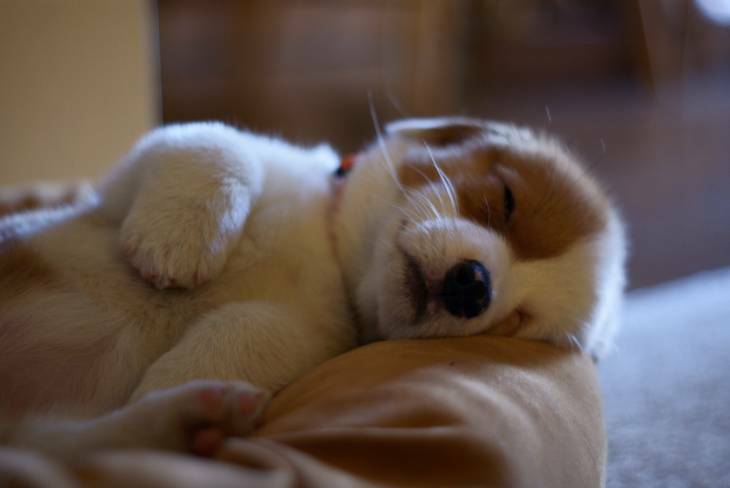 Typically, it should take around eight to twelve weeks for a puppy to get locked into a consistent sleep routine. However, this interval could get pushed back if he transitions from a breeder to your home during that time. If he’s whining and whimpering after the standard period, be patient and compassionate - there is a pretty good chance that your home is the first place that your pooch has slept without the comfort of his mother or siblings. Dogs of all shapes and sizes thrive on routine and consistency, and this is especially true in the puppy stage. The best way to do this is to establish a sleeping environment in your home that your little buddy can rely on every night. This will allow him to “settle in” as he gets more comfy with his surroundings, which in turn can cause him to quiet down. The chief component of this environment is the establishment of a sleeping spot, which ideally should be established on his first night he’s in your home. It’s important that you train him to go to this space on his own, as you picking him up and placing him there will make him feel like he’s being punished for something. You can use a crate to help establish this spot, but it is not a necessary piece of equipment. Keep in mind that the establishment of a good sleep spot is a two-way street. The spot that you choose for your pup needs to be as comfortable for you as it is for your four-legged friend. If you spend an inordinate amount of time worrying about the spot your dog is sleeping, your quest for restful slumber will be all for naught. I’m Planning on Sharing the Bed with My Dog - Can I Start that Right Away? It’s important that your dog learns how to sleep through the night on his own before you invite him to share your bed. This is particularly the case when he is in the throes of his whining and crying stage. If you pick up your pup and put him in your bed while he cries, he’ll associate the noise with him getting his way. They May Not Be Tired, so Tire Them Out! Dogs sleep a lot, yet they don’t have the same inherent sleep pattern that we humans have. Because of this, your puppy could develop a pattern which he is a sleepyhead during the day but a party animal at night - or, at least, a barky, noisy pooch. Fortunately, you can nip this in the bud during the puppy stage by giving him plenty of activity at smartly placed intervals of time each day. The most important thing you can do for your puppy as he learns how to sleep through the night is also the toughest. His whines and barks may break your heart even as they keep you up at night, and your first instinct may be to placate him by picking him up and showing him some love. This is not the thing you want to do. Coddling him will teach him to use his voice for manipulation. This could easily lead into your pooch dictating the terms of your sleep each night, including when it’s time for you to wake up. This is not good. Instead, work hard to resist placating your pooch and let the comfortable sleeping environment you’ve created for your dog stand out. It may be tough to do during those first nights as he whines and yelps for your attention, but he’ll be better off in the long run if you stand strong. You’ll be better off in the long run, too.